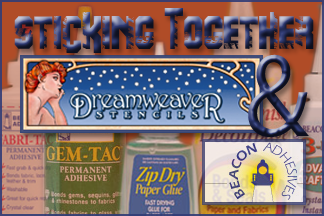 I’m having a drawer-full of fun with Dreamweaver Stencils and Beacon products this month. We’re hopping every Thursday this month so be sure to visit these other designers to see some amazing projects! I’ve been experimenting with Dreamweaver Stencils and Beacon Adhesives while upcycling some pieces for our shop – Green Door Studio. I found this old drawer at an estate sale for just a few dollars. I thought it would make a cute display holder or a shelf. After I gave it a good scrub-down and removed the handle I painted with a coat of cream paint just to give me a clean base to work with. 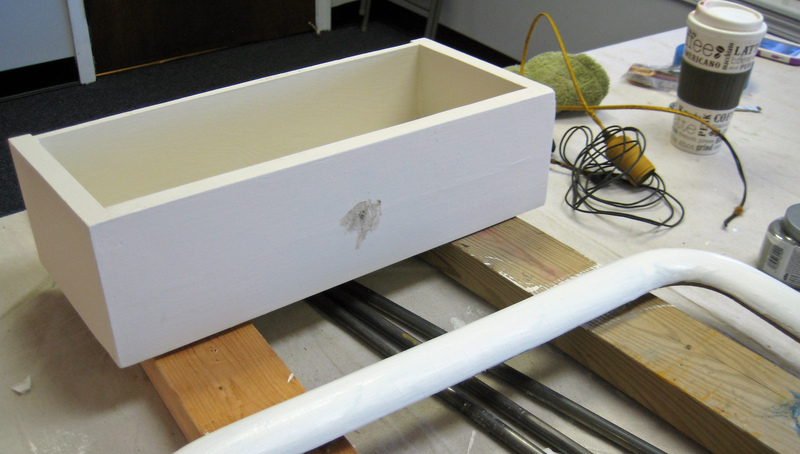 I filled the old handle hole with wood filler and left it all to dry for an hour or so. 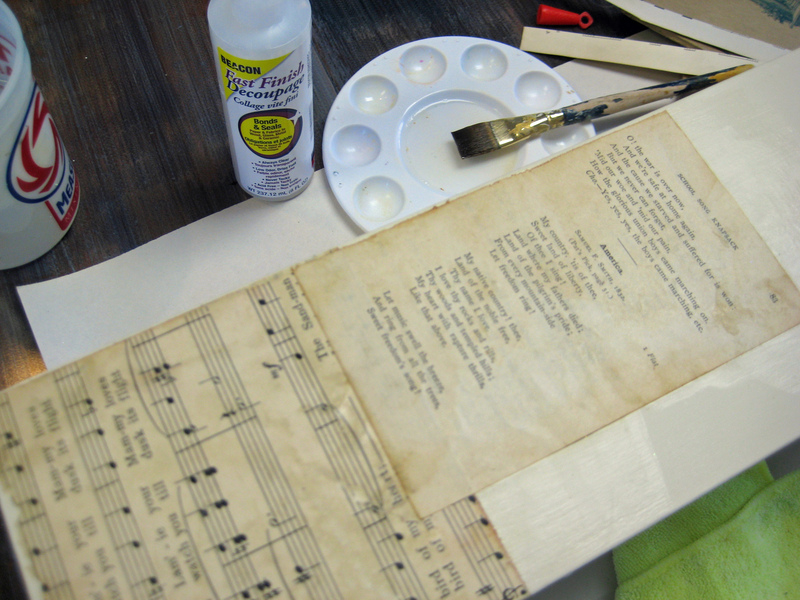 I pulled some old music song sheets out along with some dictionary pages to decoupage onto the front. I cut the pages to the size of the drawer front, inked the edges and adhered them with Beacon’s Fast Finish Decoupage Glue. 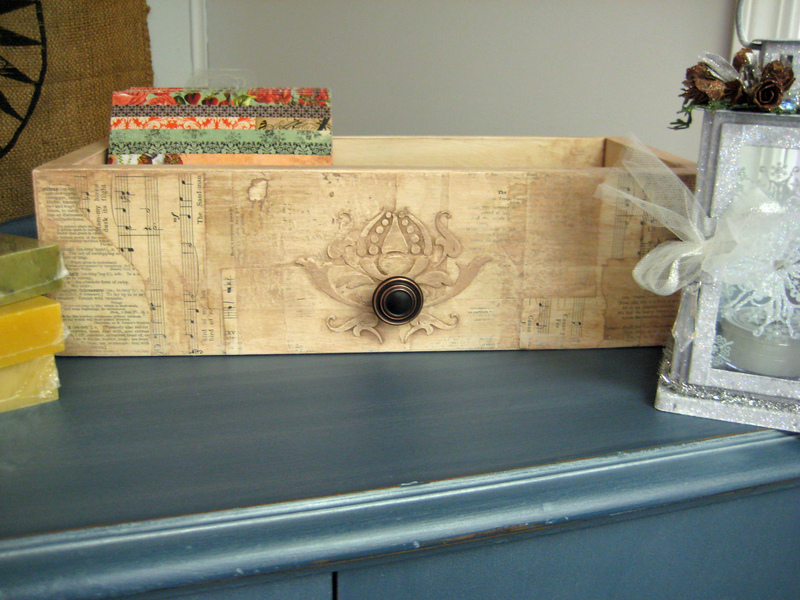 Once the entire front was covered in papers and dry, I was able to use my Dreamweaver Stencil LX 7022 Vintage Decor. I love this stencil! It turned out so nice. 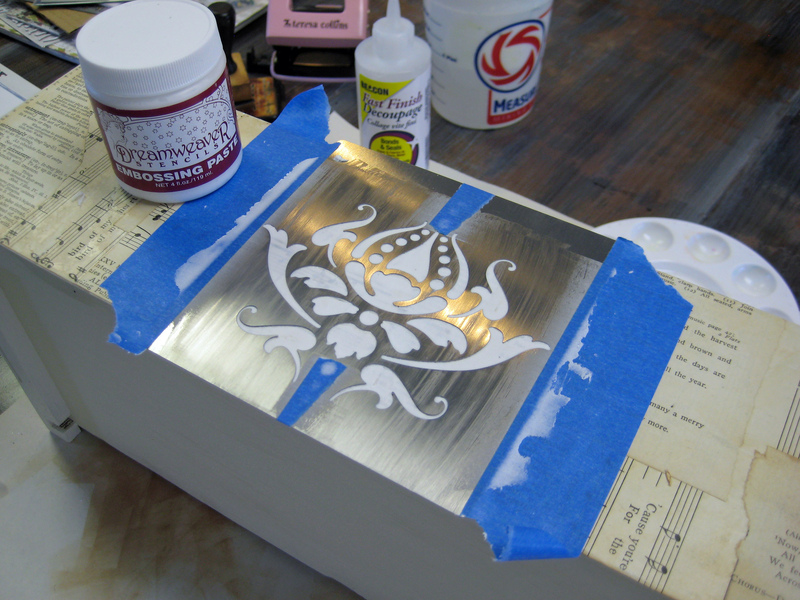 The stencil was taped in place and then Dreamweaver Embossing Paste was spread across it. The tape is carefully lifted off all sides but one (that one is left in place to act as a hinge). 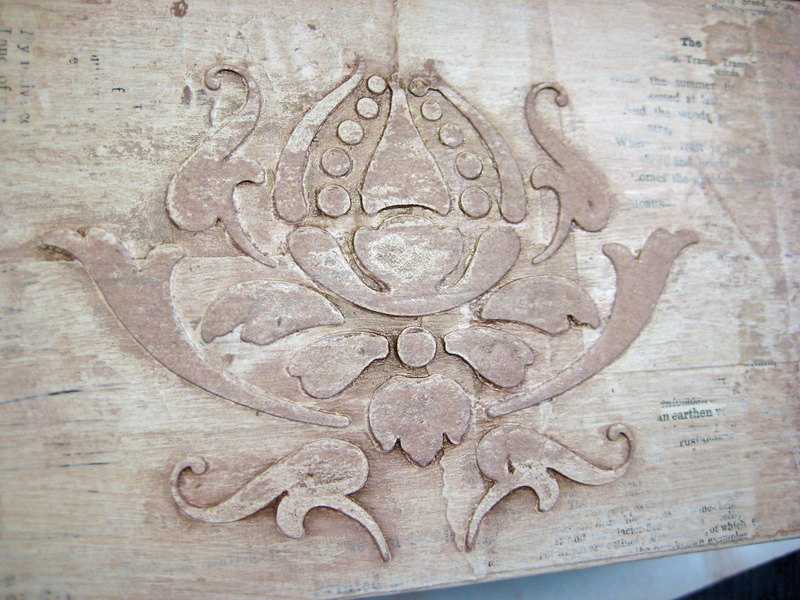 The stencil is then carefully lifted to reveal a beautiful design underneath. 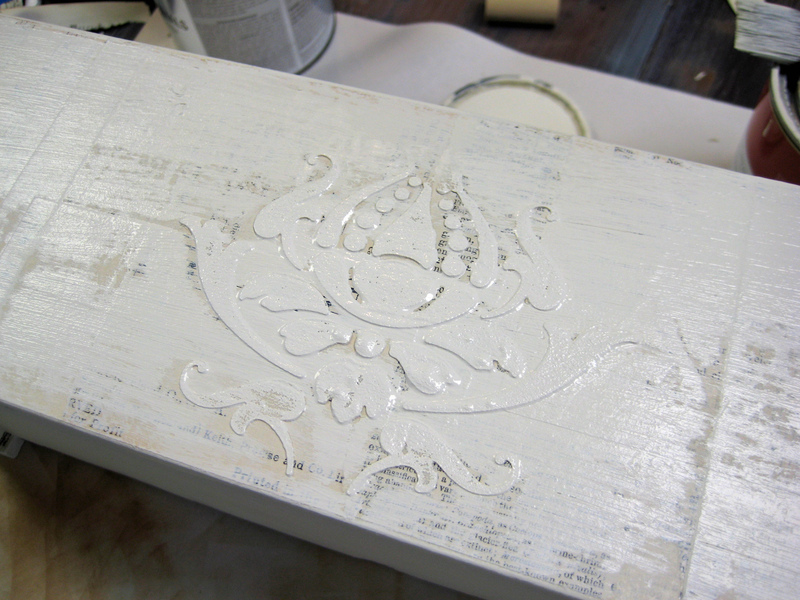 While the paste is drying (it takes about an hour or so) I had time to go work on another project. The other project didn’t take as long as I thought so I grabbed my heat tool and helped the paste along so I could continue with the painting. 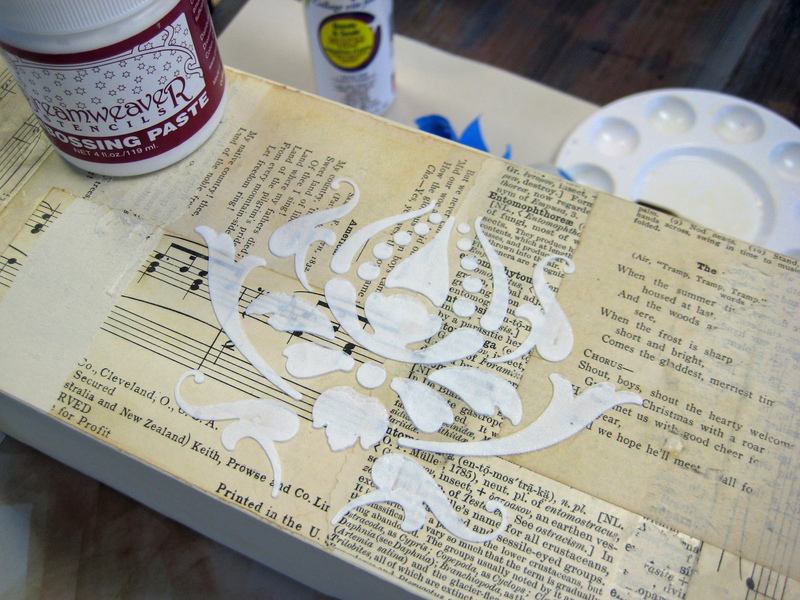 I covered the front – including the stencil – with another coat of cream paint and wiped it off with a damp cloth to expose some of the papers. I wanted to add depth to the box so added a copper metallic glaze by Martha Stewart, really squishing it in and around the stenciled area. Using my same damp cloth, wiped most of it off until I got the look I just loved! I sealed the entire box with a coat of wax and buffed it out. I never imagined this funky little drawer could look this good. 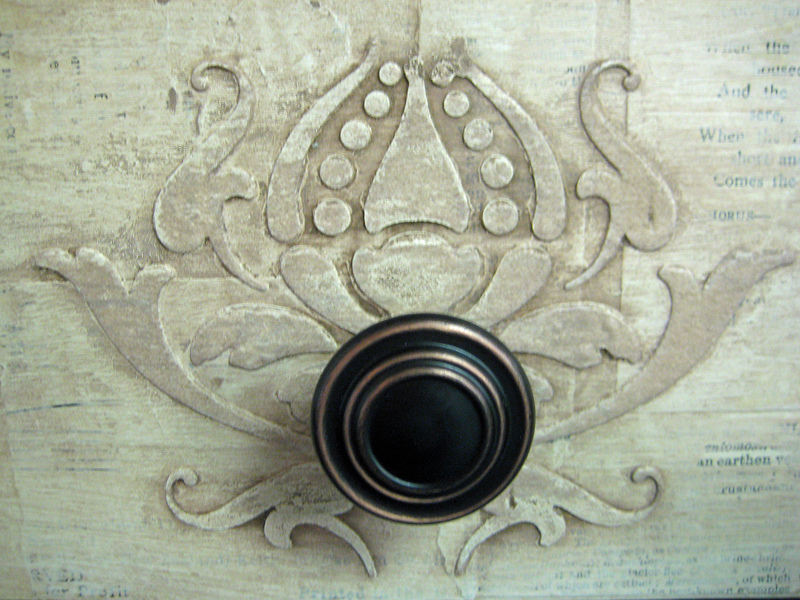 I added a copper distressed knob to the front. It’s a great little storage and display piece. 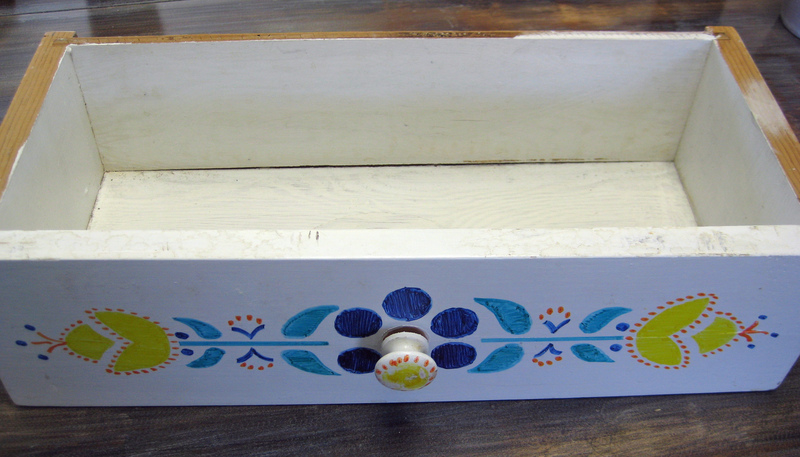 You can bet I’ll be on the lookout for more drawers to transform. Remember to visit the other designers on this hop for more great projects! Beautiful love what you have done! will have to try. Thank you, Marcia! Share your photo when done, please! Wow, what a drawer full of wonderful! Love it! This is so beautiful! I absolutely love it. It would be perfect by the door for holding hats and gloves during the winter. Thanks! I have a larger one waiting to be done as well that would be perfect for books, magazines, etc. This is amazing Linda! I love how it turned out! It’ll make me look at old drawers a whole new way. Thanks!